AOCS recently attended the 2012 World Congress on Oleo Science (WCOS) in Japan. 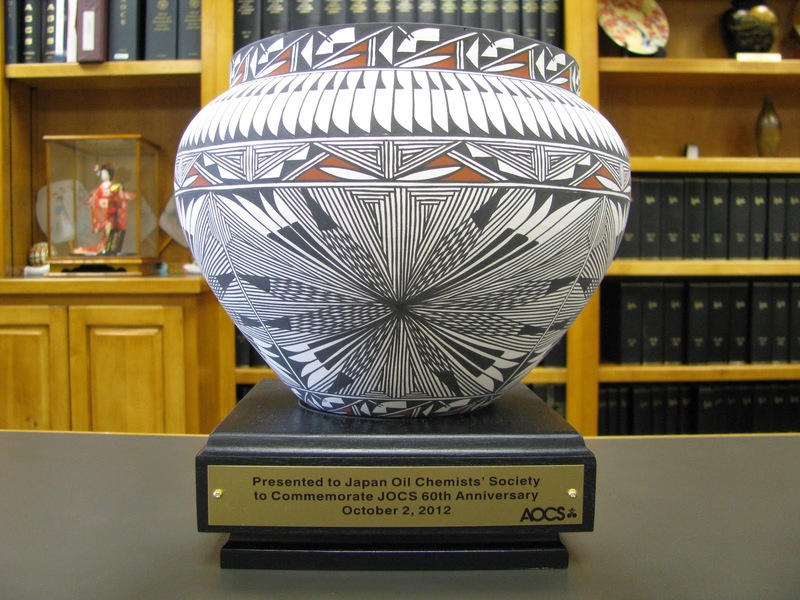 This event allowed the perfect opportunity for AOCS representatives to commemorate the Japan Oil Chemists' Society (JOCS) on its 60th anniversary. Deland Myers, AOCS President, and Patrick Donnelly, AOCS CEO, present symbolic vase to Prof. Masahiko Abe, JOCS President. The vase was selected for its beautiful design and symbols of strength and warmth, it signifies the relationship between JOCS and AOCS. It is also significant that this style of vase was historically used to store grain, seed, and water. The traditional feather design bordering the top of the vase symbolizes trust, honor, strength, wisdom, power, and freedom. The original sunburst design, symbolizing warmth, light, and happiness, has won awards for the artist, Corrine Chino. Chino is a full blooded Native American Indian from the pueblo of Acoma in New Mexico, USA.